Continuum has developed and presented several workshops to teachers, students, and youth. These include “Learn Intellectual Self-Defence,” “Introduction to First Class Web Design: First Steps to Increased Communication,” “Creating Global Citizens,” “Choices About Chocolate,” “Teaching Fair Trade: Global Education in Action,” “Global Education: In and Beyond the Classroom,” “Global Education in the Elementary Classroom,” and “Teaching at the Intersection of Spirit and Politics: Towards a Pedagogy Connecting Spiritual Liberation and Political Liberation.” The rate for these participatory and interactive workshops is $400/day + expenses, and they can be presented as half-day, full-day, or two-day workshops in any combination that you can imagine. 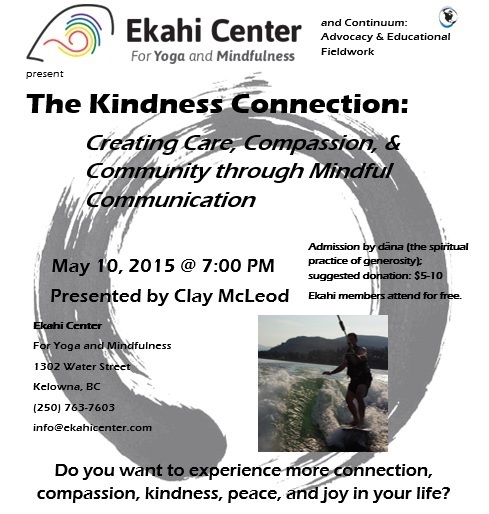 A seminar at the Ekahi Center for Yoga and Mindfulness: May 10, 2015 at 7:00 PM.﻿﻿ This successful seminar broke the Ekahi Center's attendance record for a seminar! _This seminar gave participants an opportunity to learn about mindfulness - and related practices and congruent progressive educational and parenting approaches - and how mindfulness can enhance personal wellness and an improved ability to navigate social situations. Participants learned practical exercises involving mindfulness and related practices. Participants also investigated what neuroscience has revealed about mindfulness and related practices. Participants considered how their parenting and teaching practice can cultivate a learning environment where students can thrive, experience enhanced personal well-being, and develop a desire and the ability to have an effective and positive impact on their world. See the Storify related to this seminar near the bottom of this page or at: http://bit.ly/1mvJvsm. Here is the promotional poster for "Meeting the Needs of Learners with Mindfulness." A sample of one of the concepts that was explored in "Meeting the Needs of Learners with Mindfulness:"
This seminar facilitated a process by which students learned to become critical consumers of media messages, questioning commonly-held assumptions at the foundation of mainstream media messages and thinking for themselves about history, current events, and politics, seeing connections between issues, analyzing bias in media, recognizing underlying themes and perspectives in media messages, and evaluating opinions. They also learned instructional approaches and strategies that will allow them to facilitate a similar process with their own students. See the Storify related to this seminar near the bottom of this page. This seminar facilitated a process by which students learned to become critical consumers of media messages, thinking for themselves about history, current events, and politics, questioning commonly-held assumptions, seeing connections between issues, analyzing bias in media, recognizing underlying themes and perspectives in media messages, and evaluating opinions. They also learned instructional approaches and strategies that will allow them to facilitate a similar process with their own students. Critical thinking and the development of critical consciousness utilizes creativity in order to see past indoctrination and hegemonic influences; moreover, taking action to ignite counter-hegemony requires creativity if it is to be successful and effective. You can find the participants' package here: http://members.shaw.ca/claymcleod/LearnIntellectualSelfDefenceSIE2012.pdf. See the Storify related to this seminar at the bottom of this page. Faced with today’s media landscape, it can be difficult to decide what to believe and what to think about what you read in the newspaper and on the Internet and what you see on TV. Intellectual self-defence, a term coined by linguist and political activist Noam Chomsky, is a skill, a habit, and an attitude to take when making meaning out of media messages and the issues of our shrinking and increasingly interdependent world. Intellectual self-defence is about thinking critically and for one’s self about what to believe and think about history, current events, and politics. By developing this habit of mind, one can develop the ability to question commonly-held assumptions, see connections between issues, analyze bias in media, recognize underlying themes and perspectives in media messages, and evaluate one’s own opinions and those of others. Explore how practising intellectual self-defence involves asking the right questions about what you read in the newspaper, see on TV, and have been taught in school. This Prezi forms a foundation for the workshop: http://prezi.com/969rppmtxgvf/learn-intellectual-self-defence-general-teachers-version/. Check out the participants' package for this workshop at the October 21, 2011 British Columbia Teachers for Peace and Global Education conference (Education Not Indoctrination: A Practical Approach to Teaching and Learning in the 21st Century) here: http://members.shaw.ca/claymcleod/IntellectualSelf-DefenceHandoutPAGE. Check out Continuum's brochure about critical theory and intellectual self-defence here: http://members.shaw.ca/claymcleod/CriticalTheoryBrochure.pdf. Check out Clay's article about intellectual self-defence here: http://members.shaw.ca/claymcleod/TheImportanceofIntellectualSelf-Defence.pdf. The owner and operator of Continuum, Clay McLeod, would be pleased to meet with you, talk to you on the phone, or correspond with you, either by e-mail or regular mail, in order to collaborate with you to develop and design an engaging, effective, and tailor-made workshop that will meet your particular educational needs. Continuum developed the “Intellectual Self-Defence” workshop for the October, 2009 British Columbia Student Leadership Conference in Kelowna. It gives participants an opportunity to explore Intellectual Self-Defence, which is a kind of critical consciousness that allows one to aspire to consider things (media & situations) with a view to making the world a more socially-just place. It is a set of skills that allows one to see through indoctrination in order to see how social & ecological relations can be managed in a socially-just way. Continuum’s “Creating Global Citizens” workshop focuses on global education and the subject of Fair Trade. It is a workshop for teachers and other educators designed to give them a picture of what global education is and the promise that it holds for engaging students in exciting educational activities that develop their global citizenship skills while addressing key provincial learning outcomes. It includes several teaching ideas that can be used immediately and independently as well as larger ideas that could form the basis of sustained integrated units addressing multiple learning outcomes in several subjects. Clay has presented the B.C.T.F.-sponsored workshop “Global Education: In and Beyond the Classroom” at the B.C.T.F. New Teachers’ and Student Teachers’ Conference in both 2005 and 2006 and in locations across B.C., including Kelowna, Vernon, Nanaimo, and Victoria, and with La Siembra Co-operative, he co-presented “Teaching Fair Trade: Global Education in Action” at the 2007 Canadian Teachers’ Federation Conference in Ottawa. He has also facilitated on-line “webinars” for Bridges Transitions Inc. (http://www.bridges.com/us/training/articles/sd23/teaching_strategies/creating_global_citizens/abstract.html). Continuum’s developed the interactive and participatory “Choices About Chocolate” workshop for students aged 10-16, and it focuses on the subject of global poverty and Fair Trade. Did you know that there may be poverty, child labour, and slavery in the chocolate that you eat? Many of the people that work to harvest cocoa live in poverty and work long hours in terrible conditions to bring you your favourite treat. “What can I do about it,” you ask? The answer is, “lots.” In this workshop, you’ll participate in a simulation where you can run your own chocolate factory, and you’ll learn about fair trade and how you can make choices that improve the lives of cocoa farmers and others across the world. Clay facilitated “Choices About Chocolate” at the “Students Creating Opportunities to Promote Equality (SCOPE)” Conference in Kelowna in 2005 and the 2005, 2006, and 2008 “Care and Make It Fair” Conferences in Kelowna.